Ladder Diagram is a graphical programming language used to develop software for programmable logic controllers (PLCs). It is one of the languages that the IEC 61131 Standard specifies for use with PLCs. A program in Ladder Diagram notation is a circuit diagram that emulates circuits of relay logic hardware. The underlying program uses Boolean expressions that translate readily to switches and relays. The ladder import feature of Simulink® PLC Coder™ allows you to import Ladder Diagram created with Rockwell Automation® IDEs such as RSLogix™ 5000 and Studio 5000 into the Simulink environment as a model. The ladder modelling feature of Simulink PLC Coder allows you to create Ladder Diagrams in the Simulink environment as a model. After importing or creating the Ladder Diagram models, you can do the following from Simulink. You can edit the imported Ladder Diagram model from within Simulink by using the plcladderlib library. You can generate C code from the imported Ladder Diagram and integrate the code into your existing C language-based simulation environments. You can generate Ladder Diagram code from the imported Ladder Diagram and integrate the code into your Rockwell Automation IDE. You cannot generate Structured Text code from the Ladder Diagram blocks. The Ladder feature supports only ladder code generation. You can generate PLC testbench code for the imported Ladder Diagram and verify the code in your Rockwell Automation IDE. Ladder features and elements that are supported by Simulink PLC Coder. Importing ladder files into Simulink. 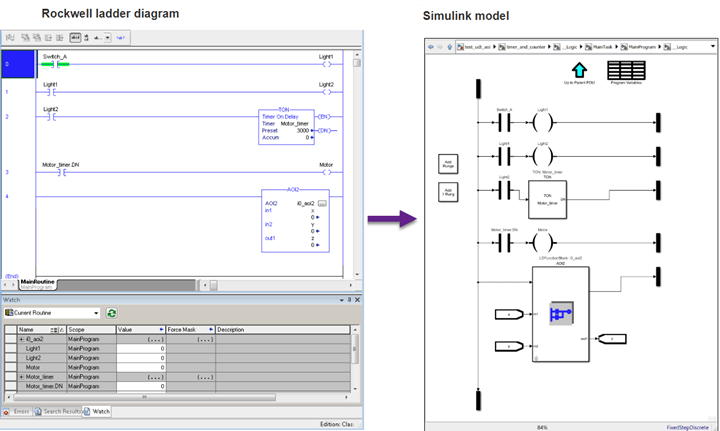 Create Ladder Diagrams in Simulink and perform simulation. Generate Ladder Diagram code (L5X) from Simulink. Verify generated code against the original Simulink model in your IDE using a generated test bench. Do ladder logic simulation and code generation from ladder tank controller model.